In static allocation, names are bound to storage locations. If memory is created at compile time then the memory will be created in static area and only once. Static allocation supports the dynamic data structure that means memory is created only at compile time and deallocated after program completion. The drawback with static storage allocation is that the size and position of data objects should be known at compile time. Another drawback is restriction of the recursion procedure. In static storage allocation, storage is organized as a stack. An activation record is pushed into the stack when activation begins and it is popped when the activation end. Activation record contains the locals so that they are bound to fresh storage in each activation record. The value of locals is deleted when the activation ends. 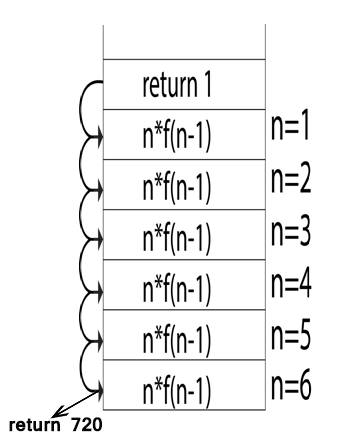 It works on the basis of last-in-first-out (LIFO) and this allocation supports the recursion process. Heap allocation is the most flexible allocation scheme. Allocation and deallocation of memory can be done at any time and at any place depending upon the user's requirement. Heap allocation is used to allocate memory to the variables dynamically and when the variables are no more used then claim it back. Heap storage allocation supports the recursion process.